Curiosity House, The Shrunken Head by Lauren Oliver and H.C. Chester is an exciting book, set in the 1930s in New York. When a fourth child joins the group of orphans with extraordinary abilities living in Dumfrey’s Dime Museum of Freaks, Oddities, and Wonders, murders begin happening, and people think it’s linked to the shrunken head, the newest addition to the museum’s collection. When the head is stolen, Max, Pippa, Thomas, and Sam will do all the can to solve the Curse of the Shrunken Head. One of the best parts about the book is the characters, so different from each other, and anybody I have ever met. This is the best book I have ever read! 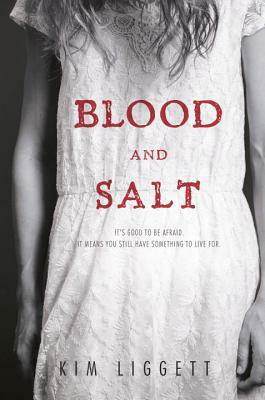 On reading the very first page of Blood and Salt by Kim Liggett, I was instantly hooked. I really appreciate Liggett’s rich detail and how she describes every part down to the smallest detail which created strong imagery. As I read, I could picture everything happening including Ash’s gruesome vision of the dead girl hanging upside down on the kitchen table, ropes digging into her ankles, a trace of blood running from her cut across her hand. Ash’s visions are as evocative as watching a horror movie. This suspenseful page turner centers around 17 year old Ash, daughter of Nina Larkin, a woman who escaped the harsh, spiritual commune of Quivira Kansas 17 years ago to raise her children in New York, away from the Mayhem that existed back home in Kansas. Ash is a girl who could possibly be a conduit, someone who sees into the past and a has visions of their ancestors including the gruesome rituals that they conducted. When her mother’s final protection spell fades, she finds herself even more plagued with visions of her ancestor named Katia. If that isn’t enough to handle, Ash is haunted by visions of a dead girl. A girl she is tied to because of her gift. A girl that has been with Ash ever since she could remember. A girl that may be Katia, but looks just like Ash. With just six precious days left and the clock ticking, Ash and her brother Rhys set out to go to Quivira, Kansas to save their mother from doing the unthinkable on the night of the summer solstice. Ash and Rhys want to save their mother Nina, but as their journey becomes more and more harrowing, Ash realizes it isn’t just her mother that needs saving but also herself. This book is perfect for the young adult looking for the ultimate fantasy suspenseful thriller. I love this book and hope that the author makes another one like it because it was great. My favorite part was when Aldert dove into the water, and his stone was not the same as everyone else’s stone. They were trying to find out why his stone was different than everyone else’s stone. I hope there are many more books like this to come! Abbey Force and Bee Force are best friends, yet they’re totally different. While Bee is a focused school girl and is never in trouble, Abbey loves adventure and is always getting herself and Bee into trouble. Usually Bee has to get them out of it. When the girls are watching the mayor’s dog Yemasee, bad men hit the dog with a car and take off with her. Abbey and Bee are furious and going to get Yemasee back at any cost. In the meantime, a man named Mr. LaBell, who was already sued by Abbey’s dad, is up to no good. He’s digging a giant hole where a slave graveyard used to be. Abbey and Bee will go through a lot to save Yemasee and the graveyard. They risk a lot and gain a lot of courage. I highly recommend this book. The Luck Uglies is a 10 out of 10, a five star rating. This book is awesome! It is about a girl whose dad is the high chieftain in a criminal organization. Her village, Drowning, is under attack by ferocious beasts called bog noblins. I think this book is great and would recommend this book to anyone who likes action and mystery. The book Catch You Later Traitor by Avi is about the Red Scare in 1959. A boy named Pete Collison is a 12 year old who loves Sam Spade. But, when an FBI agent comes to Pete’s house accusing his dad of being a communist, Pete finds himself in a real life mystery. My favorite part of the story is when Pete and his dad go to see his uncle who later dies. My favorite character in the story is either Pete or his dad. I liked the book because I love reading stuff around the World War II time period.